On the back of the Dash Core Release v.0.14.0, DASH saw a massive bullish wave over the past few days. Dash [DASH] pumped to become the highest gainer in the top-20 coin list, overtaking IOTA [MIOTA] and Monero [XMR] to become the 13th largest cryptocurrency in the market. Pegged on three core features, the new update is touted as a “milestone for the Dash Core protocol.” Its primary feature is the Long Living Masternode Quorums or LLMQs which will improve scalability via enhanced consensus and build on the cryptocurrency’s use-cases. The addition of LLMQ-based Chainlock is claimed to severely reduce the risk of 51 percent mining attacks and the LLMQ-based InstantSent adds to the scalability of InstantSend. The update will allow only one message per transaction on the network, and once the transaction is observed via the node, the InstantSend will be confirmed. March saw Dash rise by a whopping 33 percent. Furthermore, Equicex, a London-based exchange platform and debit card service, integrated Dash, facilitating greater retail implementations for the coin. Dash began its upswing on 26 March as the market floated above the $143 billion mark. 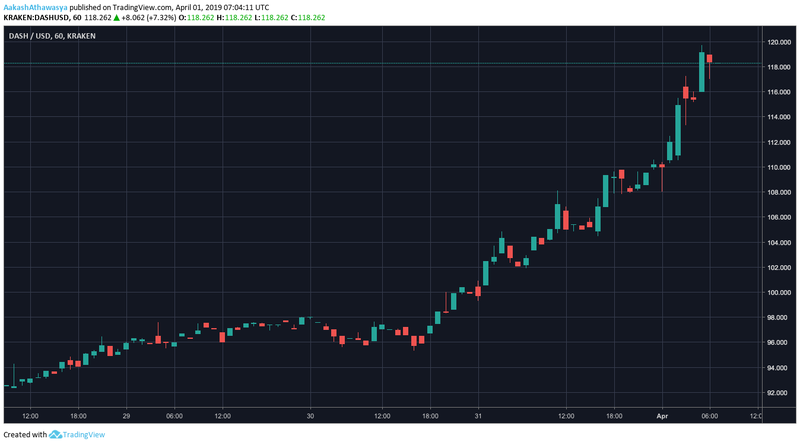 After a consistent four-day rise, the virtual currency broke the $100-barrier for the first time since November 2018. The coin’s most prominent rise began on 31 March, when the coin pumped by 13.88 percent. At press time, the price had dipped mildly to $114.80. On the back of this rise, Dash also broke the $1 billion barrier at 0530 UTC on 1 April. At press time, it was trailing the 12th largest coin, Bitcoin SV [BSV]. Surprisingly, the recently-hacked South Korean exchange, Bithumb took the top-spot for DASH trading volume, accounting for 31.93 percent of the total trade volume via the trading pair DASH/KRW. Other notable exchanges on the list were ZMB and ZB.com. The post Dash [DASH]: Protocol update triggers 13% price rise; dashes past IOTA and Monero appeared first on AMBCrypto.